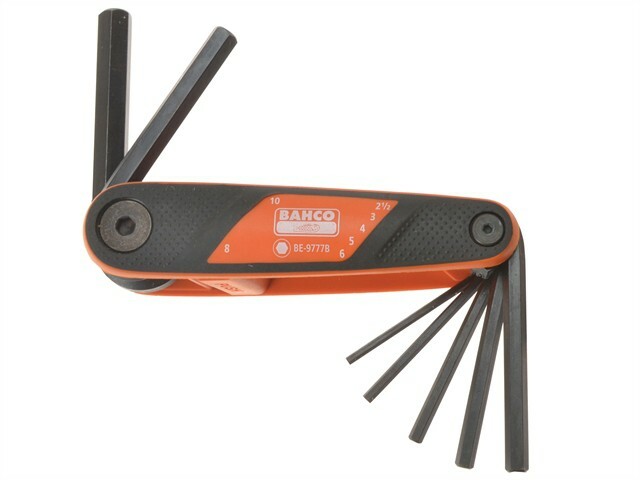 This Bahco Hex Key Set consists of 7 hexagon offset drivers with a black finish. The keys are in metric sizes and are resistant to impact and rust, and do not conduct heat or cold. The wide opening push button allows easy and automatic release of the blades, which have a positive stop at 270º for maximum leverage. Allows for different working positions. This compact set is easy to store and to be carried in a pocket. The 2-component soft grip handle ensures user comfort. The BAH9777B Hex Key set has the following sized keys: 2.5mm, 3mm, 4mm, 5mm, 6mm, 8mm and 10mm.